Make a question to me.Anyone. and i answer it to you. If no, you better start running. Any question? Let me think.... [1 hour later] Hm.... If you had to eat someone to live, who would be the first person you would eat? *Waves hand* OH! OVER HER! PICK ME! MEEE! Why do you keep roleplaying? Nice question,citizen, although it's too much relative (e.g. :plane crash at a snowy mountain, how many people present). Your insistence is to big to be ignored, citizen, however, i'm not so sure, because makes so much friggin time that i don't play CB.Anyway, i guess it's Vanguard Fencer. I don't keep.My last roleplay was like 2 months ago.It's something occasional if you see me talkin either as a civie and/or other thing.Now to the point; i roleplay because i have some issues in making some interpretations at school (like one time, i were A DOG, damn it), so i roleplay from time to time.Hope you got this,citizen. I don't make questions. I ask them. You feeling lucky, punk? 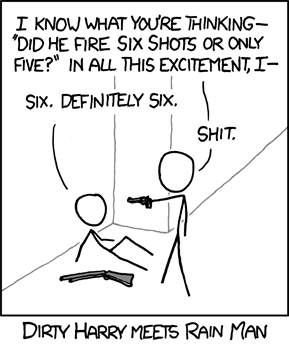 Did I fire six bullets, or only five? If you could know the exact date & time of your death, would you want to know? And why? So you want me to go into details? OK then. You and everyone that's active here (the reason because I want you to choose between people everyone here knows) are stuck in a sandy desert with no source of food or water except for the other people who are also thinking about cannibalism. Now which person would you feast on first? Also you can cook them if you want to because for some reason someone brought along a portable gas cooker. Ok now can you answer? You fired zero bullets because you don't have a revolver.And if you have, you're in some big trouble. No, i'd rather live every moment as the last one, citizen. The weakest one, since their meat is tender and softer. OH~ Another question over here! What happened in your past to make you so... Alien-like? Well that answer raised another question. Who would you consider the weakest one? And just in case, everyone has gone without food or water for the same amount of days. My gun chambers seven bullets. If it meant the lives of several people you love, would you sing one of Justin Beiber's song along side him on a live stage? If you did, what song would it be? What kind of cruel, twisted person would make singing along with Jbeibs ransom? what is phobos suppose to mean~? It appeared on Doom, and based on that id Software made the skin "Phobos" for Doom/Doomguy in Quake 3 Arena. Citizen, you have got to be kiding me!I was always human. In relation to the gun, i'm faster than you to shoot, so Haha you're dead! About Nilla, i don't even know who he/she is, i have lots of things to do on my duties. Citizen Trill, i'm sorry to disappoint you, but i have no loved ones. Citizen knyx, that is the reason why we need more CPs in here.So that no one will do things like that. P.S. :PM me if you want to help us to stop this cruelty. Citizens Tuskin and Astral_Godess, who's the founder of this topic? Me or you? The one with more psychological problems.I mean not retard or something like that, but someone that's almost going bonkers. Subject: Re: Make a question to me.Anyone.